The Oakland Police Department told the California Department of Justice that its homicide unit had a 25 percent clearance, or solve, rate in 2007. Homicide chief Ersie Joyner III told the department’s top brass that his unit had a 37 percent solve rate that year. Since then he has revised that number to 54 percent. Then-Criminal Investigation Division chief Jeffrey Loman said in his annual report that the homicide unit’s clearance rate was 44 percent and was sure to climb to more than 50 percent. At a time when law enforcement leaders nationwide are stressing that accurate data is critical to good police work, the Oakland Police Department cannot produce reliable homicide statistics that meet national standards. This means no one really knows how the unit’s performance stacks up against other police departments, and it raises questions about how the department can assess the effectiveness of its crime-fighting strategies. This shortcoming has serious implications, some experts said. Oakland Assistant Chief Howard Jordan said the department’s internal records are correct and thorough, and the department is working to make its public reporting more accurate. “We’re providing training and looking at ways to fix that,” Jordan said. The Chauncey Bailey Project has determined that the solve rate for homicides in Oakland in 2006 and 2007 was about 40 percent. This number is an estimate based on analysis of spreadsheets and work documents provided by Joyner and the Alameda County District Attorney’s Office, which brings charges in the cases that homicide detectives solve. The Bailey Project was unable to make estimates for the years before Joyner became homicide chief, in 2006. 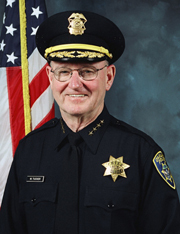 In 10 years, the Oakland Police Department has had six homicide chiefs. One was promoted, one retired and four were transferred as part of the department’s rotation policy, officials said. No. 7 begins in March, when Joyner will be transferred to patrol. The Bailey Project arrived at the 40 percent clearance rate by using a formula set by the Uniform Crime Reporting Program, which has been in existence since 1930 and is used by most police departments to gauge performance. Even though the Oakland Police Department Web site says “the only certified crime numbers are those contained in the UCR,” its homicide unit uses a different formula, one that Joyner inherited when he became homicide chief. It gives the unit consistently better results than the formula used by the Uniform Crime Reporting Program. — The Uniform Crime Reporting Program includes only murder and non-negligent manslaughter in its homicide category. Oakland includes murders, non-negligent manslaughter, justifiable homicides, accidental homicides, fetus homicides and manslaughter by negligence. — For Uniform Crime Reporting purposes, cases are counted as cleared in the year the case is solved, either by arrest or by clearing the case without arrest, such as when the offender dies. But Oakland counts clearances in the year the murder occurred. That means the annual solve rate that Joyner reports to his superiors is always changing, as murders get solved in future years, and it cannot be compared to other police departments or even to itself. Meanwhile, the Oakland Police Department has been separately reporting much lower homicide clearance rates to the state Department of Justice, apparently in error. Records experts at the department are trying to figure out how long the reports have been wrong and how those incorrect numbers are being produced. The movement among police agencies nationwide to stress the importance of keeping accurate, detailed data is being led by Los Angeles police Chief William Bratton, Dyer said. Both Dyer and Bratton believe in constantly analyzing homicides, arrests and solve rates, by city and by neighborhood, and posting it online so citizens can keep track, too. Oakland posts homicide counts but no arrest or clearance information. Joyner said he is developing a Web site for the homicide unit that will post arrests, and Jordan said last week the department will launch a Web site next year that will eventually report arrests and clearance rates. Since Dyer’s department began tracking detailed information about homicide clearance rates, using the Uniform Crime Reporting formula, his solve rate has improved dramatically, Dyer said. One insight was that many Fresno homicides — like many Oakland homicides — are gang retaliations. So a homicide in Fresno now triggers a 24-hour nonstop investigation, using two teams of two detectives each as well as district crime suppression teams, gang units and traffic officers, to prevent that retaliation. “We direct a lot of resources toward gangs and preventing gang retaliation after a violent act,” Dyer said. In Oakland, a single two-man homicide team catches all the homicides that happen in a week. Jordan said last week he would like some day to have the resources to double the size of the unit’s five teams to four investigators each.